AVN: Australian Vaccination Network or Anti-Vaccination Network? But nonetheless, the fact remains that there are those who are opposed to vaccines, sometimes vehemently so. One example is the Australian Vaccination Network. I'm writing about them today because, although they are well known to our Antipodean friends, I suspect they may not be quite so well known here in the UK. The AVN would probably deny being "anti-vaccine", of course. For some reason, anti-vaccinationists almost always do. That's something else I find puzzling: if you are opposed to vaccination, why not just say so? It's almost as if you knew you were taking a completely intellectually unjustifiable and morally bankrupt position. Well, apparently providing information about vaccines was unacceptable to AVN. My contributions to the thread were deleted. Now, does that seem like the action of someone who believes that "everyone has the right to access all available data on vaccinations"? It seems more like the action of someone who is more keen to hide information about vaccines, and replace it with dangerous propaganda. Apparently my posting information was "antagonistic" and "won't be tolerated". But does any of this matter? Well, yes, I believe it does. Some kinds of conspiracy theories are harmless enough. If people want to believe that NASA faked the moon landings, then we may laugh at them, but it doesn't really do any harm. If people believe in vaccine conspiracy theories, then they may put their children's lives at risk. They may also put other people's children's lives at risk, if their own children carry vaccine-preventable diseases which then infect others. So, for example, when the AVN go around telling people that they shouldn't be vaccinated against pertussis, and when people in Australia die from pertussis, you can't help but wonder whether lives might have been saved in the absence of such a vocal anti-vaccination lobby. Of course, we have anti-vaccinationists in the UK as well. JABS is probably the best known. Now I could be wrong about this, but I get the feeling that few people in the UK take JABS seriously: they are generally seen as a fringe movement of cranks. Their website looks like something that's been cooked up by a bunch of crazy conspiracy theorists. But AVN looks like a more professional set-up, and that should be a cause for concern. Happily, it looks like the Australian legal system may be about to force them to change their name to something a little more honest. But I think we should not be complacent here. It's important to recognise organisations like AVN for what they are. They are not simply "providers of information". Make no mistake: groups like the AVN are a dangerous threat to public health. 2 responses to "AVN: Australian Vaccination Network or Anti-Vaccination Network?" I always think that if somebody is prepared to censor critical remarks it is an indication that their arguments are weak. I also think that vaccination is a force for health. Nevertheless you should be a little careful with your graphical arguments. Subsequence is not consequence and whilst I am prepared to believe that in many cases vaccination is an important contribution to the decline of disease ins some cases there may have been other important factors at work. Fair point Stephen, correlation is indeed not causation, particularly if we're talking about mortality from vaccine-dependable diseases, where better care probably plays a large part too. And indeed even if talking about disease incidence, factors other than vaccination may play a part for some diseases, particularly for ones where there's a significant hygiene-related component, such as hepatitis A. 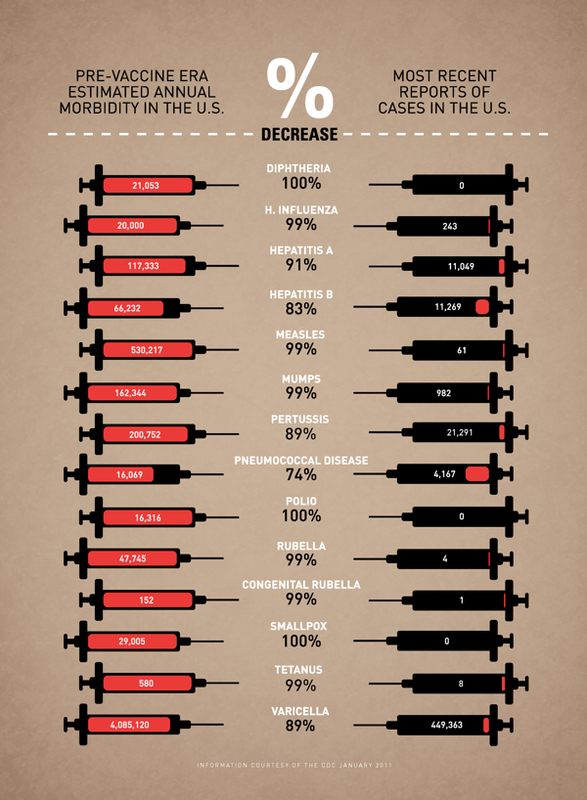 But for the spectacularly contagious diseases like measles, it's hard to imagine any plausible reason other than vaccination could have had much of a contribution to such a dramatic decrease in incidence.